This is the 4th book in a series that started in 2008. It builds upon the book “Implementing the Energy Performance of Buildings Directive (EPBD) – Featuring Country Reports 2012”, highlighting the important advances achieved across the EU in implementing the EPBD in the period 2012-2015. It is however a self-standing book, as it contains all the pertinent updated information for each country, i.e., it does not call on previous editions for information. The previous versions, together with this latest book, do however provide a good historical perspective, as an attentive reader can infer how the different issues have evolved over the years, both at EU and at national level. Part B of the book contains reports from the 28 EU Members States plus Norway. In two cases (Belgium and the UK), separate reports are available for different jurisdictions that have their own autonomy to implement the EPBD. The individual national and regional reports contain a snapshot of the status of implementation at the end of 2014 or, in other cases, sometime during 2015. Download the full book here (file size: 91 Mb). Access individual country reports here. These reports comprise part A of the CA EPBD book “2016 – Implementing the Energy Performance of Buildings Directive (EPBD) – Featuring Country Reports”. Implementation of Energy Performance Certificates: database, number of certificates. Current minimum performance: calculation method and type of requirements. Minimum performance of technical building systems: requirements for heating, hot water, cooling and ventilation systems. Nearly Zero-Energy Buildings: definition, cost-optimal calculations. Inspection of heating and air-conditioning systems: responses to Art. 14 & 15, number of inspections. Download the most recently updated table of KIDs (2015) here. Independent control of Energy Performance Certificates is foreseen through Article 18 of the Energy Performance of Buildings Directive (EPBD – Directive 2010/31/EU) to guarantee the quality of the EPCs and to make them trustworthy and reliable at the same time. Annually verifying a statistically relevant random sample of all EPCs is a challenge for a lot of MS. The costs to run an independent control system are high, both for developing the needed IT tools, and for the needed expert staff. Member States must do a significant effort in order to build and operate an, as efficient as possible, independent control system. Ensuring and improving the quality of the EPC system via an independent control system is an iterative and continuous process. Monitoring the quality of the EPC system is crucial. The development of a central EPC database, with storage of all EPC related information (input data and calculation results), is an essential part of the EPC scheme and a unique opportunity to collect information on the national building stock. A central EPC database can be coupled to various (future) uses, including that of quality assurance of the EPCs. Different types of control may be organised at several steps of the process. Effective sanctioning should be part of and support the overall system. Targeted communication strategies will help to improve the acceptance and reliability of EPCs. 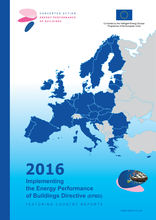 This report from the Concerted Action EPBD provides information on how EPC schemes and related independent control systems are developed and operated in Member States. The report is downloadable here. The requirement for performing cost-optimal calculations is stated in Directive 2010/31/EU – EPBD, whereby the cost-optimal level is defined as “the energy performance level which leads to the lowest cost during the estimated economic lifecycle”. The EPBD also requires MSs to report on the comparison between the minimum energy performance requirements and the calculated cost-optimal levels, using the comparative methodology framework provided by the Commission and accompanying Guidelines. MSs must report to the Commission all input data and assumptions used for these calculations, as well as the results of the calculations, from two perspectives: the societal perspective, and the perspective of the private investor. This report summarises the work performed within the Concerted Action EPBD from January 2011 to May 2014 in order to help MSs meet the European Commission’s requirement for calculating cost-optimal levels of buildings’ energy performance for new and existing buildings. The information collected aims to merge know-how, experience and lessons learned from MSs carrying out calculations of cost-optimal energy performance levels, comparison of the calculated levels with the national requirements, and implications on the national requirements for the energy performance of new and existing buildings, to form a valuable basis for the next round of cost-optimal calculations. According to the EPBD (Directive 2010/31/EU), Member States must implement mandatory certification of new and existing buildings, along with periodic certification of public buildings. The certification process results in the Energy Performance Certificate (EPC), which comprises the energy efficiency scale, selected energy indicators calculated based on the adopted calculation methodology, general information about the building (e.g., location and climate), and an extensive attachment with comprehensive information about the building in terms of components and energy systems, including recommendations on how to improve the building’s energy efficiency. Energy indicators are displayed both as quantitative values (e.g., in kWh/m2.year) and as rating results (e.g., A, B, C and so on), thus allowing the easy comparison between buildings in terms of energy performance. Furthermore, MSs are required to ensure that the energy performance indicator of the EPC of buildings or building units having an EPC, and being offered for sale or rent, is stated in advertisements in commercial media. Through the EPC, the EPBD aims at creating awareness for the energy efficiency of buildings by making relevant information publicly available and allowing the comparison of the energy-related quality of buildings. This serves the overall objective of the EPBD, which is to contribute to the transformation of the real estate market towards increased energy efficiency in buildings. The EPC as an instrument to support market transformation. High quality EPCs as a precondition for market acceptance. EPC-databases as a core element for making use of EPCs. Making the best use of EPC indicators in advertisements. Concerted Action (CA) EPBD has closely followed the process of setting up national applications of the Nearly Zero-Energy Building (NZEB) definition in the Member States (MSs) during the years 2012 to 2015. There was a continuous effort on presenting, analysing and discussing first ideas for the detailed definition, draft definitions, and definitions by front runner countries. By the end of April 2015, about 60% of the MSs had already fixed their detailed NZEB definition in a legal document. Several others had draft definitions available that were under review by the government and other organisations. This report includes the national applications of the NZEB definition as of April 2015 in all 28 EU MSs plus Norway, and it analyses how the required “very high energy performance“, the “very low amount of required energy” and the “numerical indicator of primary energy” have been specified in the national legislation. Moreover, it analyses whether there is a direct or indirect requirement for “a very significant contribution of renewable energy” in the national legislations. Are these types of buildings – or even buildings with higher levels of energy efficiency – already available in the EU Member States? What do such buildings look like? What are the cost implications and technologies used, and how is user experience? This report is a collection of 32 examples of buildings realised in the different EU Member States which have an energy performance level that fulfils (or would most probably fulfil), or even surpasses the set (or envisaged) NZEB national requirements. The examples have been selected and provided by the EPBD Concerted Action national delegates. Compliance checks of building energy performance requirements were already a reality in many Member States before the introduction of the EPBD. In addition, the implementation of sanctions is now formally required by Article 27 of Directive 2010/31/EU. This article states that MSs shall lay down penalties applicable to infringements of the regulation. According to Article 28, MSs shall adopt and publish, by July 2012 at the latest, the laws, regulations and administrative provisions necessary to comply with Article 27. MSs should apply penalties to infringements of their regulation implementing the EPBD the latest by January 2013. According to the OECD report “Regulatory Enforcement and Inspections”, the major challenge for governments is to develop and apply enforcement strategies that deliver the best possible outcomes by achieving the highest possible levels of compliance, while keeping regulatory costs and administrative burdens as low as possible. This position is in line with the EPBD vision that a law that prescribes energy performance requirements is not sufficient on its own to reach the goal of energy efficient buildings with a good indoor climate in the new building stock. Experience in recent years has shown that regulation without enforcement leads to lack of compliance, whereas the existence of penalties increases compliance with the regulations. EU MSs are gaining more and more experience in this field. This report gives an overview of the status and methods used by MSs to check compliance with energy performance requirements of new and refurbished buildings, as gained through discussions in the context of the Concerted Action EPBD. The EPBD allows Member States to choose alternative measures in place of regular inspection of heating and air-conditioning systems, and many of them do so. But this option imposes an obligation to report the alternatives and demonstrate they are equally effective in saving energy. How that should be done has been the subject of several Concerted Action meetings and papers, and a Working Group has proposed a framework for approaching the task. Whatever methodology is used, there are likely to be difficulties with obtaining reliable data and justifying the assumptions needed to construct an energy model. This documentation has been prepared by a Joint Working Group of the Concerted Actions for EPBD, EED and RES. Its aim is to encourage and assist Member State authorities in the task of formulating their long term strategies to mobilise the large scale energy efficiency upgrading/ renovation of their building stocks, as required by Article 4 of the EU Energy Efficiency Directive. The core of the Main Document takes the form of a series of nine steps, each containing a checklist of indicative issues to be considered, followed by signposts to two other documents: Annex 1 which contains 69 examples of potentially useful approaches, case studies and other documentation; and Annex 2 which is a supplementary reference offering detailed expansions on the checklist of 61 high level questions, and can be viewed as an extended menu. The documentation does not seek to identify or answer all the issues that need to be addressed in developing a strategy. But we hope that it provides a useful starting point for Member State authorities by way of posing a series of possible questions to be addressed in partnership with stakeholders, in conjunction with signposts to some possible productive approaches to tackling particular challenges, including examples of relevant actions and experiences. While the specific content of the resulting strategy in each Member State is the responsibility of the Member State, it is hoped that this resource will help towards the ultimate efficiency and quality of delivery of the set of strategies required across the 29 countries subject to the Directive, and help their effective early implementation. Read more in the summary report or download the full report. An analysis of the outcomes of the national dialogue in 26 countries between the competent authorities implementing the Energy Performance of Buildings Directive represented in the Concerted Action EPBD and the BUILD UP Skills consortia working on improving the skills and qualifications of buildings workers. The aim of this dialogue was to examine how building energy efficiency regulations are influencing the market for construction works, as well as how leveraging workers skills and contributing to improved execution quality will boost the effective implementation of the regulations. Download the full report or the summary report. 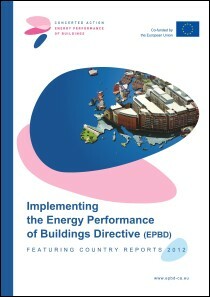 The individual reports are contained in the Concerted Action EPBD book “Implementing the Energy Performance of Buildings Directive (EPBD) – Featuring Country Reports 2012”. • financial instruments, namely for rehabilitation. Download the book here or access the individual country or thematic reports. Automatic monitoring systems for heating, cooling, and other technical building systems are mentioned in the EPB recast Directive 3 times. This encourages their adoption, and there is a strong incentive if it can be shown they are able to reduce the need for physical inspection. Monitoring has been discussed in the Concerted Action EPBD 2011-2015.Those responsible for implementing the recast Directive at national level were urged to allow for the possibility of introducing automatic monitoring later, even if such schemes are not yet ready. It is important not to close off the opportunity inadvertently, but the case for building it into legislation requires further development and convincing evidence. Concerted Action EPBD members requested this to be expressed in terms that can be presented to those responsible for introducing national legislation. Dr. Ian Knight contributed the present paper, giving suggestions on how to do so. The CA conducted a study on initial experiences and challenges for setting cost optimal levels for energy performance requirements in 2011. The results were used as input by the EU Commission in their work of establishing the Regulation on a comparative methodology framework for calculating cost optimal levels of minimum energy performance requirements, later published in 2012. In addition to the executive summary report released by the CA in August 2011, the full detailed report on this study is also available. Download the full report or the executive summary. Download the 2010 Book or access the individual country or thematic reports. The 2013 Concerted Action EPBD Stakeholders meeting took place during the EU Sustainable Energy Week in Brussels on 28 June 2013. The Book ‘Implementing the Energy Performance of Buildings Directive – Featuring Country Reports 2012’ was launched during this joint EC – Concerted Action EPBD event and panel discussions followed between several top experts in the field of the EPBD and the market. Stakeholders also provided their statements on the topics under discussion.